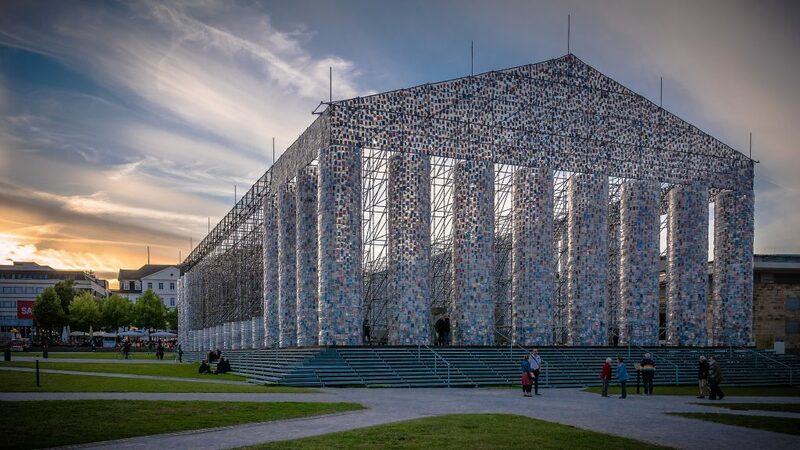 Argentinian artist Marta Minujín’s installation, “The Parthenon of Books,” is a replica of the temple of the Acropolis in Athens, assembled from as many as 100,000 books that have been banned in various countries across the world. Originally presented in 1983 after the fall of the military dictatorship in Argentina, it was installed in 2017 as part of the art exhibition documenta 14 on the Friedrichsplatz in Kassel, Germany, where in 1941, approximately two thousand books were burned by the Nazi regime. Three of Canadian author Margaret Laurence’s novels were included on the longlist of banned books for the Parthenon installation that is featured on the documenta website. Heinz Bunse 2017, CC BY-SA 2.0, via Flickr. Following the worldwide success of his 2007 novel The Book of Negroes, Lawrence Hill received an email from a man in the Netherlands informing him that he was going to burn Hill’s book, based largely on the fact that the word “Negroes” was present in the novel’s title. The title comes from a historical document of that name from 1783 that sits at the centre of Hill’s novel. As the CBC reports, Hill’s book was, in fact, burned as an act of protest against the perceived racism of publishing a book with such an offensive term. In response to this incident, Hill, who has long been a fervent campaigner against censorship, delivered a lecture entitled “Dear Sir, I Intend to Burn Your Book” which was later published by the University of Alberta Press. In this case, both the challenger of the book and the author of the book were Black men who viewed their actions as resisting racism. Research the ways in which this incident was reported in the press, and break down both the challenger’s argument and Hill’s argument in terms of Cohen’s criteria for censorship. To get you started, you might want to take a look at the CBC’s coverage of this story, or watch some of Hill’s lecture at the Canadian Literature Centre, upon which his book was based. Consult Freedom to Read Week’s database of books that have been challenged in Canada. Some of the texts are Canadian; others are not. Select one book. Then examine the information you find in this database and supplement this with additional information you can find about this challenge (e.g., newspaper reports, responses from the author, discussions on social media). Based on this research, outline the reasons why the book was challenged, who challenged it, and what the eventual outcome of the challenge was, using Cohen and Woodcock’s understanding of censorship. If you were tasked with defending the book against censors, how might you construct your argument? If you were tasked with censoring the book, how might you construct your argument? Margaret Laurence’s 1974 novel The Diviners is not only one of Canada’s best-known pieces of literature, but also one of Canada’s most censored pieces of literature. Sheila Turcon’s case study of Margaret Laurence’s novel, hosted by the Historical Perspectives on Canadian Publishing project, allows you to view archival documents relating to Laurence’s censorship case. You can view letters from Laurence’s friends as well as letters to Laurence from her publisher, McClelland & Stewart. Freedom to Read Week is a project of the Book and Periodical Council, which functions as an umbrella organization for editing, writing, and publishing associations in Canada. Here you can find various resources and events for Freedom to Read Week, including archives of previous years’ events. PEN Canada, a division of PEN International, campaigns for the freedom of imprisoned writers. PEN Canada also fights against censorship, including intervening in legal cases, educating students about the freedom of expression, documenting international violations of freedom of expression, and supporting refugee writers who seek amnesty in Canada. “Dutch Group Burns Cover of Hill’s Book of Negroes.” CBCnews. CBC/Radio Canada, 22 June 2011. Web. 23 Jan. 2018. “Freedom to Read Week.” Freedom to Read. Book and Periodical Council, n.d. Web. 23 Jan. 2018. Hill, Lawrence. “Dear Sir, I Intend to Burn Your Book.” Canadian Literature Centre 2012 Henry Kreisel Lecture. Edmonton, AB. 27 Apr 2012. “PEN Canada.” PEN Canada. N.p., n.d. Web. 23 Jan. 2018. Turcon, Sheila. “The Censorship of Margaret Laurence’s The Diviners, 1976-1985.” The Censorship of Margaret Laurence’s The Diviners, 1976-1985. McMaster University Digital Collections, n.d. Web. 23 Jan. 2018.